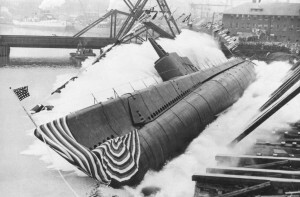 The SS-265 USS Peto was the first United States Gato class submarine built by a freshwater shipyard, the Manitowoc Shipbuilding Company. The shipyard was located on Lake Michigan in the port city of Manitowoc, Wisconsin. It was Manitowoc’s first time building a submarine. Amazingly, the men and women working on the sub managed to finish 288 days before the date specified in the contract for delivery. They made a total of 28 submarines of the Gato class and Balao class submarines for the war effort. 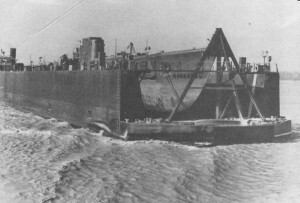 The USS Peto was laid down on the 18th of June in 1941, months before the infamous attack on Pearl Harbor in December of 1941 (USS PETO (SS 265)). After 10 months of labor, she was launched sideways, in the Great Lakes ship builders’ tradition, into the Manitowoc River. The reason for the sideways launch was constraints, primarily the water depth and width of the river. She was the first submarine ever to be launched sideways. The sponsor, Mrs Emanual A Lofquist, broke the launching Champagne bottle on the bow of USS Peto on April 30, 1942 (USS PETO (SS 265)). The specifications of the Peto were similar to other submarines of the Gato class of fleet submarines: length of 311 feet, 9 inches and a beam of 27 feet, 3 inches. Floating on the surface, the Peto drew slightly more than 15 feet (SS-265). Accommodations aboard the Peto were quite cramped as it has a surface displacement of only 1,526 tons and housed a crew of six officers and 54 enlisted men for patrols up to 75 days in length (SS-265. Each patrol had varied weapon load outs. The main and stealthy option was located in the hull of the Peto and other Gato class submarines. The hull was equipped with ten torpedo tubes of 21 inch diameter, in the configuration of six in the bow and four in the stern. The standard torpedo was the Mark 14 which was replaced in later patrols with the electrically driven Mk 18 torpedos. The two types of “fish” were Peto’s primary offensive weapons of the war, accounting for all but one of her kills. Browning machine guns in .30 and .50 caliber could be mounted depending on the conning tower space or hand held, along with various handheld crew weapons stored in the hull. The first five patrols had a 3 inch/50 caliber dual purpose gun for anti aircraft use and surface action. After the first patrol, the 3”/50 caliber gun was moved forward of the conning tower. The fourth patrol was just after some modifications to the pilot house on the conning tower which allowed the use and installation of a 20 millimeter Oerlikon automatic cannon. The Oerlikon was fed by a 60 cartridge drum magazine making it useful for anti aircraft, small boats and for antipersonnel. This was used frequently to dispose of anti-shipping mines on numerous patrols. The sixth patrol featured a 4 inch/50 caliber deck gun instead of the dual purpose 3”/50; the 4”/50 could not be used against aircraft. The 4”/50 gun was short lived, being replaced for the 7th through 10th patrols with a 5 inch/25 caliber deck gun. A single 40 millimeter Bofors antiaircraft gun was installed on the eighth patrol, which also could be used to attack small surface targets. US Navy gun naming convention names the gun by caliber and the barrel length in multiples of the caliber. The 3”/50 gun would have a barrel length of 3 inches multiplied by 50, meaning 150 inch (12.5 feet) long barrel. The USS Peto served exclusively in the Pacific theater of World War Two, undergoing 10 combat patrols from bases in Brisbane, Australia and Pearl Harbor. However, she was made in a shipyard on a freshwater river connected to a Great Lake, a way to reach the ocean was needed. This required the sub to be put on a special barge on the Illinois and Mississippi Rivers after commissioning on November 21st, 1942 and then recommissioned after reaching New Orleans around January of 1943. The Peto was used three ways: alone, wolf pack and lifeguard duty with air cover. A typical solo patrol would cover assigned sectors of the Pacific to the submarine in unrestricted submarine warfare. Wolf packs would be used mid to late war to increase the effectiveness against Japanese shipping. Several submarines would be coordinated to search the same area in close communication. Once a convoy was found, it would be stalked until the available submarines in the area could be assembled to dispatch the convoy. Its a tactic taken from the Germans. Lifeguard duty was simple, patrol at set distances from the airbases and targets so that aircrews could successfully ditch their aircraft and be rescued. Each mission type did have its successes and its failures, however it shows a strategy shift with US fleet submarine use during the Second World War in the Pacific theater of operations. The mid to late war was similar in style to the German U-boat tactics in the North Atlantic Ocean. Success did improve when working with other vessels and aircraft as seen during the seventh and tenth patrols. The submarines did the job that was needed in the war of attrition with an island nation spread out in the vast Pacific Ocean. So much so, that Japan was forced to use smaller sampans instead of tankers and other merchant vessels. Without inbound material, Japan could not afford to out produce the Allies. The Peto and her crew sank seven Japanese vessels, and rescued downed airmen while on lifeguard duty during various patrols. This directly contributed to the war effort by sending what the transports were carrying to the bottom of the ocean, thus contributing to a war of attrition. Also, rescuing airmen helped keep experienced airmen alive and back in the fight. In addition to the war of attrition contributions, the USS Peto also served in a role of denying the enemy of shipping lanes, thus forcing the Japanese to send escorts with their transports and/or find new lanes to use. On her 10th and last patrol, the atomic bombs were dropped, ending the war. After the war the Peto was used in the naval reserve, and then after 1956 used as a training submarine until it was sold for scrap in 1960. The Peto was used in solo and wolfpack roles, supporting the war of attrition against Japan, along with performing search and rescue as part of lifeguard duty for the large air raids against the Japanese cities and manufacturing centers. Nelson, William T. U.S.S Peto: Report of First War Patrol. US Navy, 1943. Nelson, William T. U.S.S Peto: Report of Second War Patrol. US Navy, 1943. Nelson, William T. U.S.S Peto: Report of Third War Patrol. US Navy, 1943. Nelson, William T. U.S.S Peto: Report of War Patrol Number Four. US Navy, 1944. Van Leunen,Jr. Paul. U.S.S Peto: Report of War Patrol Number Five. US Navy, 1944. Van Leunen,Jr. Paul. U.S.S Peto: Report of War Patrol Number Six. US Navy, 1944. Caldwell, Jr, Robert H U.S.S Peto: Report of War Patrol Number Seven. US Navy, 1944. Caldwell, Jr, Robert H U.S.S Peto: Report of War Patrol Number Eight. US Navy, 1944. Caldwell, Jr, Robert H U.S.S Peto: Report of War Patrol Number Nine. US Navy, 1945. Caldwell, Jr, Robert H U.S.S Peto: Report of War Patrol Number Ten. US Navy, 1945. “Wisconsin Maritime Website.” USS PETO (SS 265). “NavSource Online: Submarine Photo Archive.” Submarine Photo Index. Ed. Gary Priolo. Michael Mohl. “SS-265, U.S.S. Peto – Fleet Submarine.” Fleet Submarine. “Submarine Warfare of World War II Rare Documentary.” YouTube.